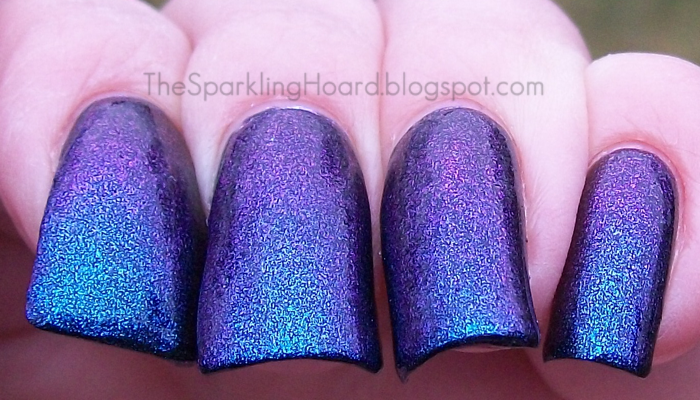 Today we have yet another amazing polish from Indigo Bananas! It was cloudy and rainy yesterday, but as you'll soon see, this strong duochrome had no trouble showing off for the camera! Shadow is a duochrome glass fleck. It shifts from a rich, deep blue to a pinky-purple color (sometimes even a sort of golden pink at some angles). This isn't a shy shift, either. It's easily visible in various forms of lighting. Formula was great, no pooling, no clumping, etc. Dry time was a little on the slow side. I used 3 coats, though you might be able to get away with two coats if you have shorter nails or tend to do thick coats. Indigo Bananas says one coat can be sheer enough for layering, but I haven't tried that yet. Side Note: You can also custom-order the duochrome glass fleck in a clear base if you want the shift but don't want the dark base color! Amazing, right?! I'm so glad I bought this! Shadow costs $10 for 15mL or $4.50 for 5mL. You can find the indigo Bananas Etsy shop HERE and you can "Like" Indigo Bananas on Facebook HERE. Indigo Bananas also has a website, found HERE.